The steel from the debris of the World Trade Centers provides evidence that the buildings were demolished. "A one-inch column has been reduced to half-inch thickness. Its edges -- which are curled like a paper scroll -- have been thinned to almost razor sharpness. Gaping holes -- some larger than a silver dollar -- let light shine through a formerly solid steel flange. This Swiss cheese appearance shocked all of the fire-wise professors, who expected to see distortion and bending -- but not holes"
"A combination of an uncontrolled fire and the structural damage might have been able to bring the building down, some engineers said. But that would not explain steel members in the debris pile that appear to have been PARTLY EVAPORATED in extraordinarily high temperatures" (pay-per-view); or see a cached version of the article here. Steel does not evaporate unless it is heated to at least 5000 degrees Fahrenheit. Everyone agrees that fires from conventional building fires are thousands of degrees cooler than that. In addition, there was molten metal running under ground zero for months after 9/11. So far, no reports of molten metal from any previous building fire have surfaced. And while some have attempted to argue that molten metal under the Twin Towers was caused by the enormous friction created by the collapse of the 110-story giants, building 7 -- which was only 47 stories high -- seems to have experienced the same temperatures as the Twin Towers. 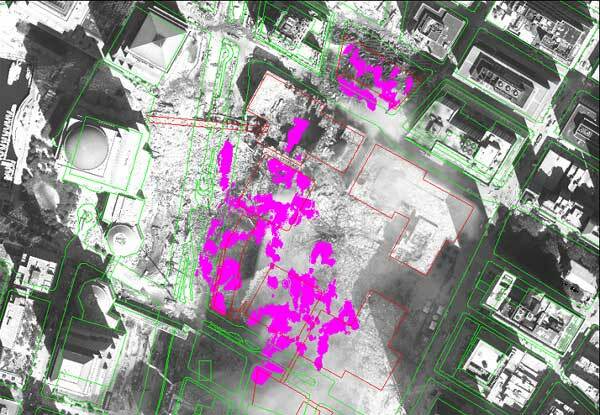 Specifically, this thermal image of ground zero with an overlay of the demolished buildings, taken five days after 9/11, shows that the debris under building 7 (the trapezoid-shaped building at the upper right) was about as hot as under the Twin Towers. See this web page (lower left) for an explanation of the thermal image, this aerial photo showing the shape of WTC7, and the maps contained here which confirms which building is building 7 on the thermal image. The friction argument simply doesn't work, since a 47-story building cannot have experienced nearly as much friction as 110-story buildings. And remember it was building 7 which experienced partial evaporation of its steel beams. The sulfur and other unusual chemicals, gaping holes, partial evaporation of steel, and molten metal from the trade centers are therefore very strong evidence of controlled demolition. This is evidence that the buildings were demolished the same way that a bacteria's flagellum is evidence that design, and not evolution, is the source of biodiversity. Meanwhile, some moron has posted a diary over at DailyKos claiming not just that this is "evidence" of demolition but that it's proof -- despite the absence of any positive evidence in favor of demolition. occured in those towers on 9/11. none convincing at the moment. i can't believe i am studying beautiful music in such and uglily run country/world/universe. I´d say the evaporated steel combined with the "angel is next" phone call are the achilles´ heel of the administration. I have read almost all of your very thorough remarks concerning 911 - your blog is excellent. 7 - equally important is that few (if any) alternative 911 investigators acknowledge that the very images that they base their research upon (TV clips) more than likely were compromised and edited even before being broadcast to the public. In summary, the international bankers and oil companies destroying the world and enslaving its people win either way. Destabilization, chaos and collapse of the US is inevitable - whether through the Federal Reserve and the economy, an insurrection, disease and famine, etc. - martial law will be declared, FEMA detention centers fully activated, NATO troops brought in and the genocide will begin in earnest here in the continental United States. Even if a large percentage of people became aware of the truth behind 911 and demanded the that criminals be arrested, who's gonna do the arresting? We cannot depend upon voting these people out of office (that's been compromised), the citizens have no organizational skills when it comes to revolutionary actions against a such a superior enemy and military force. People have become totally dependent upon something, or someone else outside of themselves to provide for their every need. US citizens are almost childlike - so misinformed, so naive - it's incredible. Undoubtedly, the US has been seized by a group of criminals intent on destroying the entire world and reducing its population by at least 75% within 5 - 10 years - and we are practically helpless against them. Wake me up when Washington DC is burning.